Home World Latin America Can Hip Hop Help Stop Gang Violence in Latin America? (Q24N) Insightcrime.org – Hip hop culture has long been associated with gangs, violence and vandalism. But a wide range of actors in Latin America are attempting to work past longstanding biases and challenges to experiment with these art forms as alternatives for at-risk youths who might otherwise engage in criminal activity. Three young men dressed in baggy clothes and snap-back baseball caps are rapping to a homemade beat on a portable microphone. They’re in a small house in Comuna 13, one of the poorest and historically most violent neighborhoods of Colombia‘s second-largest city, Medellín. But the house isn’t a gang hideout. And the teens aren’t rapping for a party of “pandilleros,” a Spanish term for gang members. The Casa Morada (the Purple House) is a community center frequented by locals of all ages looking for a safe space to express themselves through a style of hip hop centered around peace and social justice. The residents of Comuna 13 have long faced conflict and gang control, but many locals say that hip hop has helped change the neighborhood and its young people for the better. Margoth Yepes, known as “La Abuela Rapera,” or the Granny Rapper, watches a rap performance in the Casa Morada community center in Comuna 13. Although many residents initially associated hip hop with gangs and crime, their perceptions have been reshaped after nearly a decade of seeing hip hop used as a “tool for social transformation,” said a local hip hop teacher and community leader who goes by the rapper name Kbala. Throughout Latin America, governments and grassroots groups have attempted to harness the popularity and energy of hip hop as a tool for preventing violence and crime, particularly among young people. Some anecdotal evidence suggests such projects may be effective in terms of providing at-risk youths with alternatives to criminality. But there have been very few systematic evaluations of these efforts, and programs face various obstacles to successful and sustainable implementation. The use of hip hop to keep youths out of crime is somewhat paradoxical. The music culture has maintained associations with gangs and crime across the Americas, yet it has also gained intense popularity among young people in situations of poverty and conflict who aren’t involved — and want to avoid — a life of crime. Hip hop’s “rebellious, subversive or antiestablishment” tone appeals to at-risk youths, making it an effective entry point for attracting young people to violence and crime prevention programs, said Jonathan Furzsyfer, coordinator of the security program at the México Evalúa think tank. Young people may like it, but the associations between hip hop and crime have often made it difficult to gain societal and political support for such initiatives. 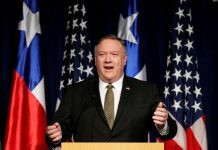 And local conditions, including the active presence of criminal groups, can pose both security opportunities and challenges throughout the region. In Central America, hip hop’s ties to gang culture are more deeply embedded and controversial than perhaps anywhere else in the region, in large part because of the style’s origins. Central American rap and graffiti have been heavily influenced by the “gangsta” hip hop style developed on the United States’ West Coast in the 1980s and 1990s. 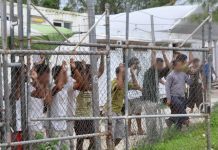 As US immigration enforcement efforts ramped up during this time, this style was brought south of the border by deported migrants, many of whom had been involved in gang activities. Along with the music and street art, these deportees brought gang structures home with them. Over the past several decades, gangsta hip hop culture has maintained its popularity in Central America. The notorious MS13 gang continues to produce gangsta rap and mark their territory with graffiti tags, as does their most prominent rival, the Barrio 18. In response, many Central American governments have repressed hip hop as part of their heavy-handed efforts to target criminal groups. 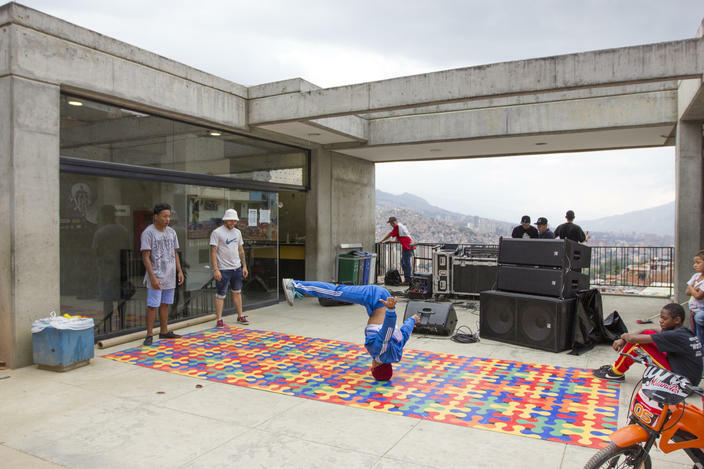 A group of DJs play hip hop and a breakdancer busts a move during a February 2017 hip hop festival in Comuna 13. Recently however, some authorities in the region have begun to differentiate between gang-associated hip hop and other forms, in the hopes of leveraging the artform to encourage young people to explore alternatives to criminal lifestyles. In El Salvador‘s capital San Salvador, for example, the federal and local governments teamed up in 2016 to implement an art and sports-based program with hip hop components called “Take Action for Coexistence” (“Actívate por la Convivencia”) in violence-ravaged neighborhoods. “Skar,” a graffiti artist who works as an instructor with Actívate, told InSight Crime that in the past, street artists were often harassed by police, looked down upon as vandals or assumed to be gang members. But with the Salvadoran government beginning to test hip hop as a violence prevention tool, Skar said that this dynamic has shifted and graffiti artists are now being called upon to help the current administration. However, hip hop-centered programs elsewhere in the region reveal how local gang dynamics can present both obstacles and opportunities. Crossing between gang territories and speaking out against criminal groups can pose serious challenges to participants’ security. For example, in Medellín’s Comuna 13 neighborhood, many “raperos conscientes” (roughly translated as socially aware, or “woke,” rappers) have been targeted by gangs and other armed groups. At least a dozen rappers have been murdered since 2009 and dozens more have been displaced from their homes. But elsewhere in the region, local gang dynamics have provided hip hop violence prevention programs with opportunities to dissolve decades-long tensions. For instance, on the outskirts of one of Mexico‘s largest cities, Guadalajara, the Más Barrio Comunidad Trabajando (More Neighborhood Community Working) program has been able to use hip hop to bridge gang rivalries. In order to carry out graffiti projects in Guadalajara’s gang-controlled neighborhoods, Más Barrio organizers often negotiated temporary truces between rival gangs, a graffiti artist and former instructor with the program who goes by the name “Frase” told InSight Crime. Frase said that Más Barrio would inform gang leaders about when and where projects would take place, both to ensure the safety of young participants crossing the gangs’ “invisible borders” and to offer gang members an opportunity to participate. Frase told InSight Crime that some members of warring gangs who met through the program began painting and recording rap music together, rather than attacking each other. Even in countries where hip hop-based prevention programs have shown promise, and an anecdotal capacity for change, governments have at times shifted back to repressive policies. This is clearest in Brazil, where current political and economic turmoil has recently swung the policy pendulum back towards the criminalization of graffiti after decades of successful experimentation with graffiti-based crime prevention programs. Since 1999, Brasília’s citizen security body has implemented Projeto Picasso não Pichava (Project Picasso not Pichava) as an alternative to earlier punitive policies that failed to stop gangs from engaging in “pichação,” a popular form of public defacement that typically involves climbing dangerous heights to spray-paint cryptic elongated symbols across highrises and highway ramps. For decades, the Picasso não Pichava program has aimed to reduce criminality among young people engaged in gangs and crime, as well as those at risk of becoming engaged, by providing them with an artistic outlet, job training, and education on social responsibility and public health issues, according to an official program description. This program and others aimed at preventing youth violence were systematically monitored and evaluated from 2009 to 2011 through a partnership between the Brazilian government, grassroots groups and civil society organizations, including the non-profit organization the Brazilian Forum for Public Security (Fórum Brasileiro de Segurança Pública – FBSP). The evaluation concluded that culture-based programs like Picasso não Pichava can serve as effective alternatives to violent activity and create safe spaces for healthy social interaction among young people, particularly when these programs are designed to fit local conditions and are closely monitored and evaluated. “Working with young people through culture serves to channel a disposition, a desire for expression and social protest” into a healthy outlet, such as diverting young people away from vandalism by teaching them to create street art murals, said the FBSP. Eddie, a graffiti artist from El Salvador, shows local children in Comuna 13 how to use spray paint during a February 2017 graffiti festival. 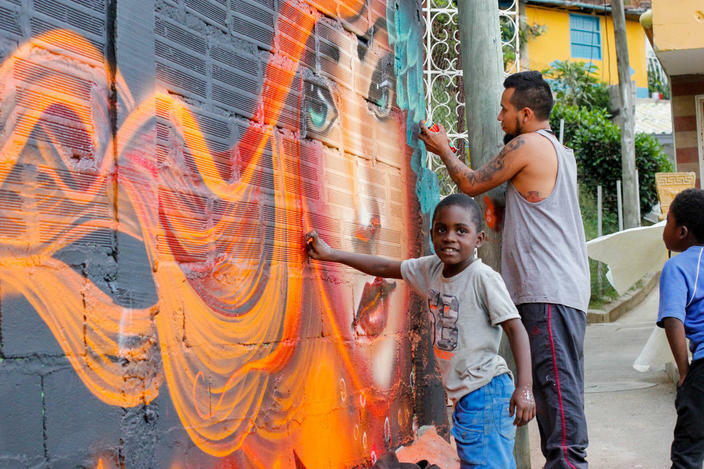 Yet despite these findings, some politicians have recently begun ramping up enforcement efforts against graffiti and cutting funds for cultural approaches to violence and crime prevention across Brazil. Last year, interim President Michel Temer dissolved the Ministry of Culture, which among other tasks managed grants for hip hop and other arts-related programs. The institution was quickly reinstated following protests, but public outrage has not stopped other politicians from following his lead. João Doria, an ally of Temer and the recently-elected mayor of Brazil‘s biggest city, São Paulo, has frozen half of the municipality’s budget for culture and started implementing a controversial new “broken windows” style program called Cidade Linda (Pretty City). Doria says Cidade Linda is intended to clean up São Paulo’s urban landscape, including by painting over unsightly pichação and targeting the “criminals” who spray-paint it. But the program has sparked public backlash after indiscriminately covering all types of graffiti, including massive murals that have become popular among residents and international art lovers. Given the lessons learned in Brasília through Picasso não Pichava, Doria’s repressive approach is unlikely to successfully reduce vandalism. And it could complicate potentially beneficial efforts to use graffiti and other hip hop arts for gang and violence prevention purposes. Leadership and funding play a major role in determining the reach and limitations of these approaches. Most hip hop-based projects, like hip hop itself, are born and bred on the streets of marginalized neighborhoods. As exemplified by groups in Medellín’s Comuna 13, community-led initiatives are particularly well-suited for navigating local dynamics and bringing authenticity to the approach, but limited funding and differences across communities have oftentimes made it difficult to scale up or replicate models elsewhere. 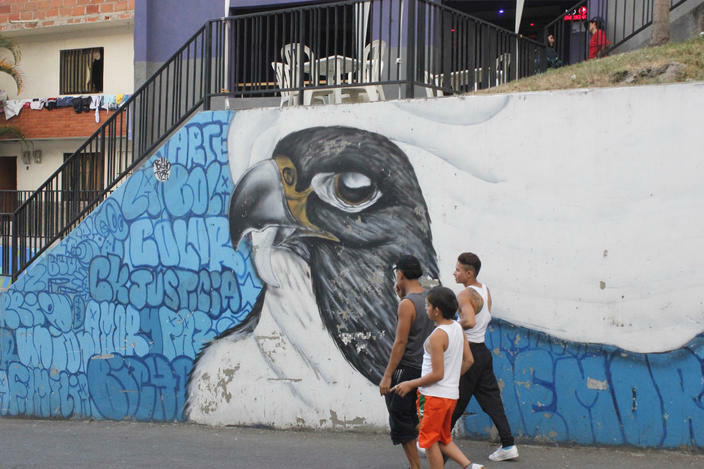 Residents and community leaders of Comuna 13 told InSight Crime that for nearly a decade local hip hop groups — often called “collectives” (“colectivos”) or “crews” (“grupos”) — have helped young people to resist joining local gangs or engaging in other criminal lifestyles. For instance, local rapper Kbala has worked at the Casa Kolacho hip hop community center for several years teaching young people how to resolve life issues nonviolently while offering them a sense of belonging and opportunities to refine their skills, gain income and reinvest in their neighborhood — all of which community members say help divert youth from criminal activity. 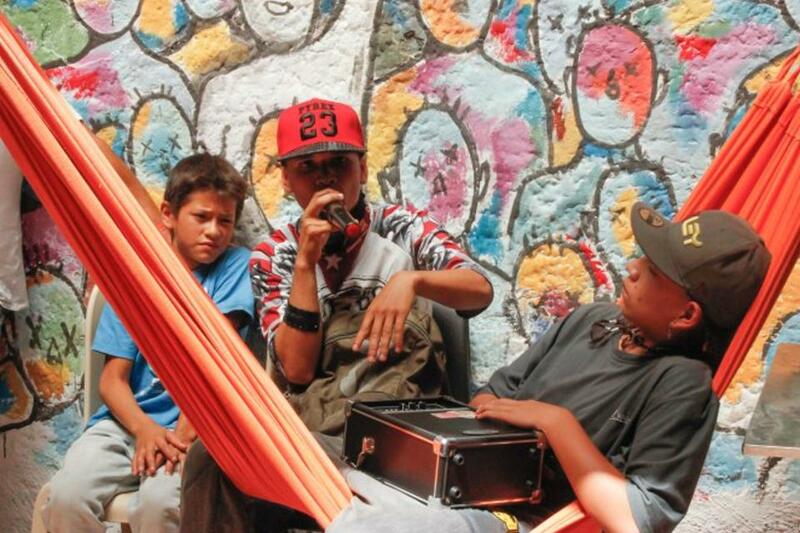 This approach to combining hip hop with community action has also been taken by other grassroots Comuna 13 groups like AgroArte, an “agrarian hip hop collective” spearheaded by Luis Fernando Álvarez, who goes by the rapper name AKA. AKA uses rap, graffiti and gardening projects to teach young people how to connect with their environment, reflect on the legacies of Colombia’s long-running conflict and denounce wartime and gang violence, as well as destructive drug abuse and trafficking. 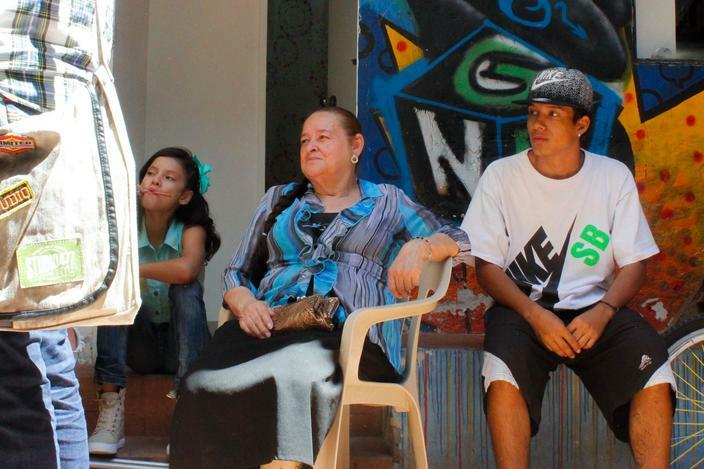 Margoth Yepes, who is affectionately called “La Abuela Rapera,” or the Granny Rapper, by AgroArte’s young participants, told InSight Crime that “practically [her] whole family is involved” in the nonviolent hip hop collective. La Abuela Rapera helps local youths write rap lyrics as a “form of protest through art” and “a way to express how they feel without being vulgar and without vengefulness,” she said. Her daughter Margoth, better known as “La Mama Rapera,” also writes and records rap music with her 9-year-old daughter and 12-year-old niece. AKA told InSight Crime that AgroArte has also been able to successfully carry out their gardening and hip hop projects in other Medellín neighborhoods and has begun documenting their methodology so that it can be shared with other groups. But he acknowledged that what has worked in Comuna 13 may not work the same way elsewhere. At times, these local conditions can complicate efforts to scale up or replicate a program, particularly when doing so requires accepting funding from outside sources. 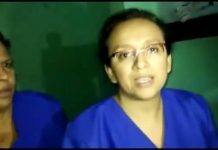 For example, many grassroots groups in Comuna 13 have turned down funding from government, civil society and private sources in order to maintain their autonomy and credibility. Kbala told InSight Crime that Casa Kolacho does not accept government support and instead funds its activities through retail sales and guided neighborhood graffiti tours in order to maintain control of their approach. Elsewhere in the region however, governments have begun funding these types of grassroots efforts, and are also spearheading their own hip hop-based programs. This support has often been critical to the success and expansion of these approaches, and can offer opportunities for monitoring and evaluation. But changing political and economic dynamics expose these programs to sudden losses of funding, highlighting the importance of sustained community support. Young men walk past a mural in Comuna 13 depicting white flags representing peace, which were waved by local residents during a 2002 security operation. These dynamics are most evident in Mexico, where Congress decided to zero out funding for the main federal violence prevention fund — the National Program for the Social Prevention of Violence and Crime (Programa Nacional de Prevención Social de la Violencia y la Delincuencia – PRONAPRED) — despite rising violence around the country. Overall, PRONAPRED was plagued by mismanagement and repeated funding cuts throughout its brief four-year stint. But the national fund provided significant resources to local governments and grassroots groups implementing hip hop-related crime prevention programs, such as Más Barrio in Guadalajara. Program coordinators for Más Barrio told InSight Crime that recent funding cuts have hindered the group’s ability to continue certain activities, reducing its effectiveness. But, as in Comuna 13, grassroots support from local residents has also been essential to sustaining Más Barrio; organizers said they plan to open a hip hop community center in a home that has been donated to the project. Still, overall in Mexico, most government-backed violence prevention programs — like many of the Mexican government’s security initiatives — were not only insufficiently funded, but also poorly planned and inconsistently implemented, according to a 2014 evaluation conducted by the México Evalúa think tank. México Evalúa’s Furzsyfer told InSight Crime that “the experiment with social violence prevention in Mexico was a first step … but there are various opportunities to improve it,” particularly through better planning, monitoring and evaluation. Although anecdotal evidence suggests that hip hop-based violence prevention programs could be successful crime reduction tools, few studies have been carried out to determine the factors that contribute to the success or failure of such initiatives. This is likely due to biases against the artform’s controversial roots and its continuing ties to criminal activity. In addition, many of the elements that have made hip hop so engaging among young people — such as its style, energy and “realness” — are intangible, making them difficult to measure and duplicate. Experts say that as with any security policy, monitoring and evaluating the outcomes of hip hop-centric programs is key to understanding how well they are working and how they could be improved. And understanding the local context is similarly crucial. “If we don’t identify the causes generating violent conduct, delinquency and antisocial behavior in neighborhoods, homes and individuals, then we won’t know what preventive strategies will help these youths to avoid illicit or criminal activity,” Furzsyfer said. In Brazil, where one of the few systematic evaluations was conducted, the study determined that cultural approaches, such as those centered on hip hop, can be effective at changing youth behavior under specific conditions; for instance, when young people are already interested in the activities being offered to them and those activities are paired with dialogue and education about the social issues contributing to local violence and crime. Hip hop is and could continue to be a powerful preventive tool in the fight against violence and crime, if included as part of broader, comprehensive security strategies. As such, violence prevention experts say that these programs should receive more investment and evaluation. * All photos courtesy of Angelika Albaladejo.